2015 Pack Olympics Is Here!!! 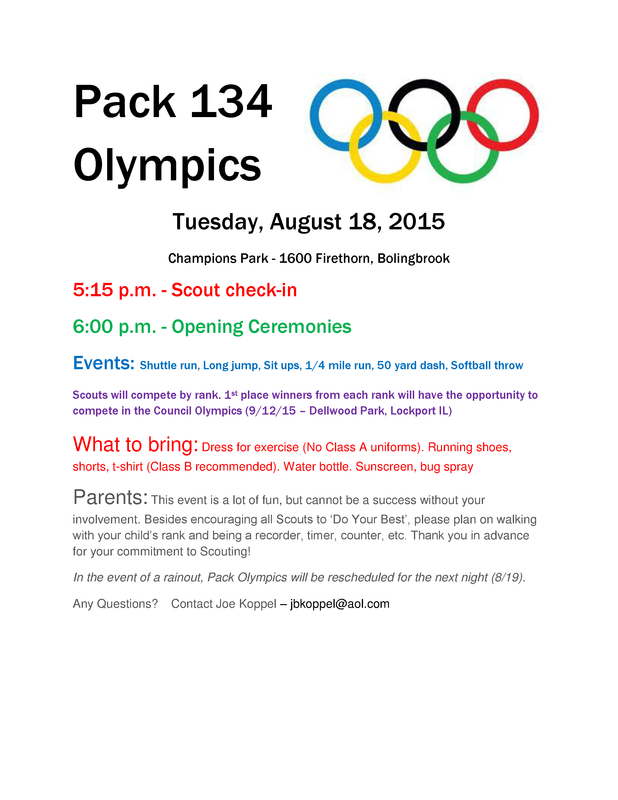 This months Pack Night will be the annual PACK 134 OLYMPICS this coming Tuesday, August 18, 2015. Scouts will compete by rank in the following events: Standing Long Jump, 1/4 Mile Run, Sit Ups, 50 Yard Dash, Overhand Softball Throw, and the Shuttle Run. Highest scoring scouts for each rank earn the privilege of competing in the Rainbow Council Cub Scout Olympics on September 12th. 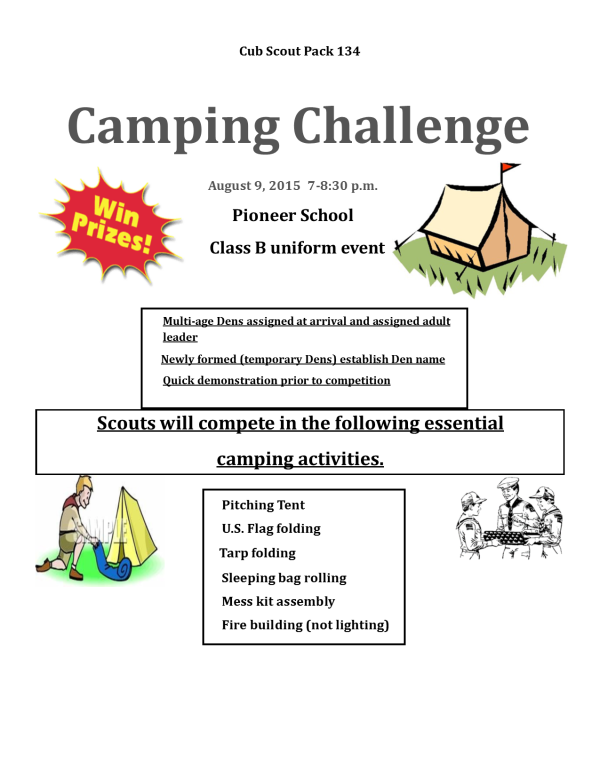 Scouts are to wear class B uniforms and athletic shoes. Also bring water bottle/bug spray/sun screen as needed. The event is held at Champions Park (Travel West on Boughton to Palmer then turn Right Champions Park is at 1600 Firethorn). Registration will begin at 5:15 p.m. and the Opening Ceremonies will be at 6:00. Scouts compete by rank and will rotate through each of the events. Tigers will start with Mile Run, Wolves with Long Jump, etc. Parents can serve as score keepers, timers, or event coordinators as well as encouragers, boosters, and cheerers. Please continually remind all Scouts to ‘Do Your Best’. After each rank has completed all events, scores will be tallied and recorded. Final results and rank winners will be announced at a later date. It should be fun evening of athletic competition and sportsmanship.